Indonesia has plenty vegetable recipe. You can make numerous dishes from every single vegetables. This country has endless vegetable that you can cooked and do magic in your kitchen. And the variation of the recipe is just delightful. Buy fresh looking product and pay attention to the color and smell. Good product has crisp, beautiful colors, no wormy holes and brown edges on the leaves. Wash your vegetables before you slicing them up. This prevent the vitamin C from dissolving in the water. Add a pinch of sugar to the water and your vegetables will taste as if they have just been picked. Side dish for many Indonesian kitchen. This side dish is very delicious in combination with fried noodles and sambal. Very refreshing recipe for in the summer time. And very easy to make. Sweet Side dish recipe, but you can also use this as a main dish with warm rice and sambal, really delicious. Fried tofu with shrimp paste and chili sauce. Originated recipe from Jogjakarta. A curry of jackfruit, chicken and egg served with rice, and is the most famous local dish. Great choice for your dinner. It doesn't matter of you are vegetarian or not. The dish is just delicious, fresh and light. The meal for everybody and the whole family. Clear soup with assorted vegetables such as melinjo (gnetum gnemon), melinjo leaves, sweet corn (still on the cobs), peanuts, zucchini/chayote and tamarind. Very delicious on the hot day. Very refreshing vegetable soup and delicious. Curry recipe with bamboo shoots. Bamboo shoots is normally used to make loempia, but this is one is very particular dish. Tasteful authentic Indonesian recipe with coconut milk. Great choice if you are a vegetarian but it is not diet friendly. Wonderful choice for the lunch. Despite the sour and spicy taste, the dish is very refreshing. And the most important part is, its low calorie recipe and very easy to make. 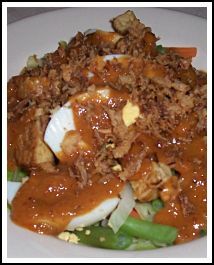 Indonesian salad with peanut sauce and emping crackers. Very popular in Europe and you buy them everywhere in Europe at the Indonesian restaurant. Mixed Salad with fried tofu, tempe and cucumber with peanut sauce. The most common daily dish that you’ll find in almost every single family in Indonesia. Healthy option for a dinner. It is easy and pretty cheap to make. And if you have a little time to make dinner maybe this is the perfect solution for you. Easy and fast recipe. It's not complicated. It's just simple and easy to follow recipe. Everybody can make it, and so are you. Do you need some more vegetable recipe? Maybe you could try authentic Chinese Vegetarian recipe. They are tasteful and the instructions are easy to follow. Get the free cooking tips by subscribe to the website and discover the easy to follow cooking technique to make you cook like a professional chef.